The eBook cover photo is eye-catching. The center portion of a bridge span is missing. It has been replaced with jagged concrete, mangled steel, and thin air. That’s a fitting image for “The Definitive Guide to Employee Communication and Engagement.” The way organizations try to connect with employees today is just like this bridge – broken. There’s a gap that can be catastrophic for businesses. Don’t just take our word for it. Study after study has shown that employees feel more disconnected than ever from their companies. Despite the availability of more systems and more channels for communication, employees paradoxically have been left feeling both overwhelmed and under-informed. Exhibit A: Gallup’s 2017 “State of the American Workplace” report. Gallup found that just 33 percent of employees are enthusiastic and committed to their work. The financial impact is staggering. Disengaged employees cost U.S. companies between $483 and $605 billion annually in lost productivity, Gallup estimated. Also, 43 percent of employees now work in a remote fashion – an increase from 39 percent in Gallup’s 2012 study. We’re witnessing a profound shift in the traditional workplace. It’s forcing companies to rethink how they engage with employees to ensure they perform at their best. There’s a growing realization that employee communication is a “must have” for business success. Like a bridge, it’s vital infrastructure. When communication is broken, your organization won’t reach its goals. Ultimately, this eBook is about fixing the problem. The Definitive Guide explains how employee communication doesn’t have to be broken . . . like a certain bridge. It can be repaired. 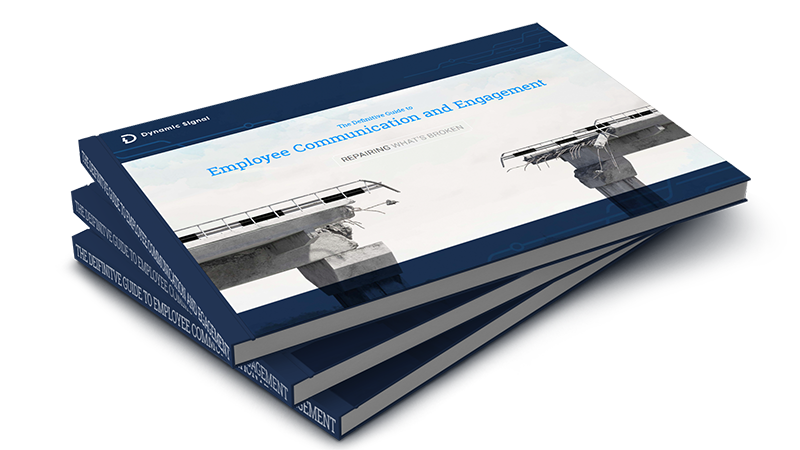 Download The Definitive Guide to Employee Communication and Engagement to learn more.